Bacteria is everywhere, but how much do we know about it? Megan Dobro, assistant professor of human biology at Hampshire College, explores how we’re learning more about these tiny machines. Megan Dobro, assistant professor of human biology, received her B.S. from Bridgewater State University and her Ph.D. in molecular biology from the California Institute of Technology (Caltech). Her work has focused on the structural biology of important macromolecular complexes, using techniques such as cell culture, electron microscopy, and 3D modeling. 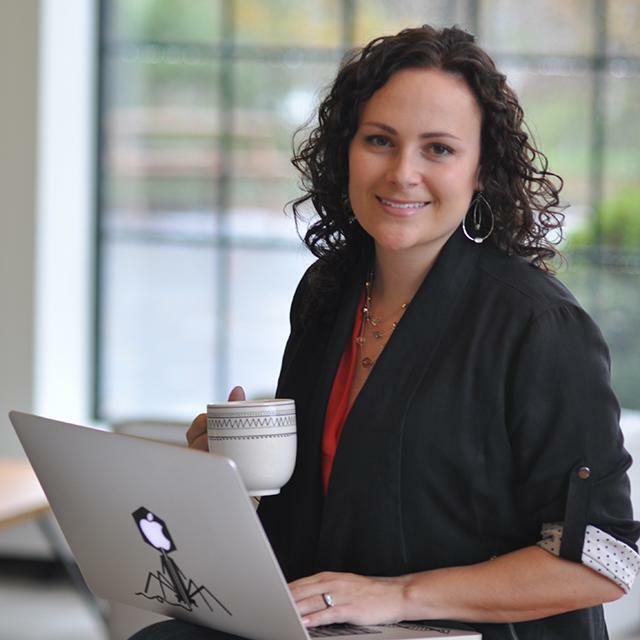 She is especially interested in viruses and bacteria that impact human health. She is the founder of the Youth Empowerment through Safer Sexuality (YESS!) program, co-founder of Hampshire’s Collaborative Modeling Center, and is passionate about supporting under-represented students in science. Bacteria are the most abundant life forms on Earth and even though they can cause illness, most bacteria actually help us. For example, gut bacteria helps digest food, provide Vitamin K, improve nutrient absorption, and strengthen our immune system. To understand them, structural biologists study the molecular structures within bacteria. One method gaining popularity is electron cryotomography, which images bacteria in three dimensions at high resolution, allowing us to see the tiniest machines in great detail. This method has given scientists a more complete picture of important structures inside bacteria, from powerful motors that allow bacteria to swim and magnetic compasses that guide them, to toxin-tipped weapons used to compete with bacterial rivals. The Jensen Lab at Caltech uses electron cryotomography to collect 3D images of bacteria. Working with a team of high school and undergraduate students we searched across the database of 15,000 3D images of 90 different bacterial species to find new structures. What we found has been very exciting. One species was covered in protruding appendages that look like the Eiffel tower with antennae. Another had thin hooks covering the surface, and a bacteria isolated from the termite gut had dense hair-like fibers growing at one end. We found twisted filaments, chains, meshes, railroad tracks, tubes, discs, rings, and horseshoes. What’s exciting is that we don’t yet know what these structures do, but they must be important for bacteria to have invested so much energy in making them. We know bacteria are essential to our planet, but they are much more complicated than we thought, containing an organized collection of macromolecular machines that allow them to thrive in their diverse environments. We are striving toward a comprehensive list of parts inside bacteria, which would help us one day be able to control those that impact human health and maybe even create our own to solve some of humanity’s biggest problems.